That notwithstanding, I just have to admit that the little bit of ghetto nerd in me has a new favorite thing: Press On nails. Realizing that the mani-pedis were costing ‘the family’ about 80$ every three weeks, I stopped going to the salon for fake nails. I would get a pedicure every couple months as a treat and for major upkeep, then just do my toes myself. But my finger nails were harder to keep nice. 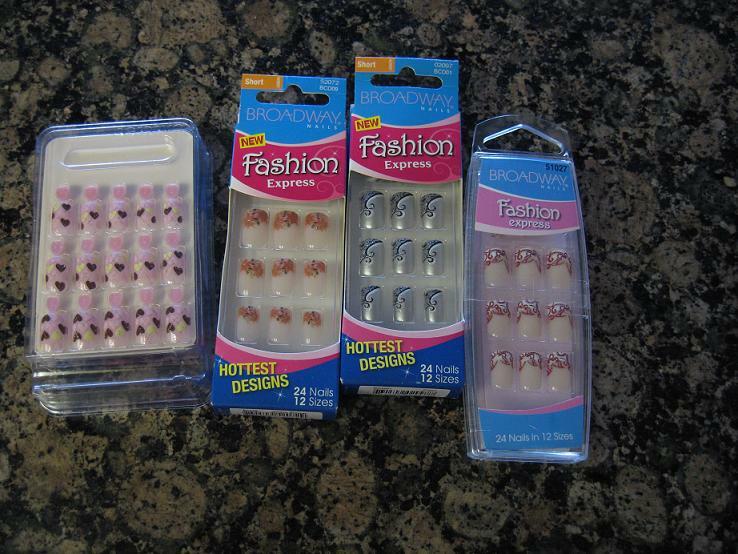 In Utah for my birthday I found a little set of nails with rhinestones and flowers painted on. That’s fancier than the french tips I was paying so much for. They didn’t last all that long in the cold and under ski gloves, but they were fun. In San Diego I’ve been wearing them every other week or so now. A set includes 24 nails typically for about 5$. I’m a savvy chick and can get two sets out of them by filing the big ones down to size. They usually last about a week, you really just super glue them on. I’ve gone crazy about them since I started getting compliments about what cute nails I had. Everyone asks where I get them done and I admit they are press ons and ignore the funny looks. What do you think? Am I the biggest dork on the planet? I am a little worried I’m too old for these things, but they’re just so much fun. This entry was posted in Drama, Shopping. Bookmark the permalink. People who would scorn your decision to save money on such a frivolous thing aren’t worth your attention. The End. It’s no big deal, it’s just my funny little thing right now. No one cares, people are just surprised. haha. What’s the 1st set on the left? Little hearts? Please don’t wear the silver/blue ones in public – those are freakish. Yes the one on the left is hearts. The grey ones are a little hoochie but look better on.